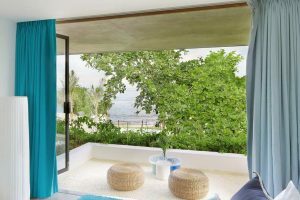 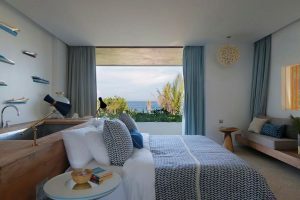 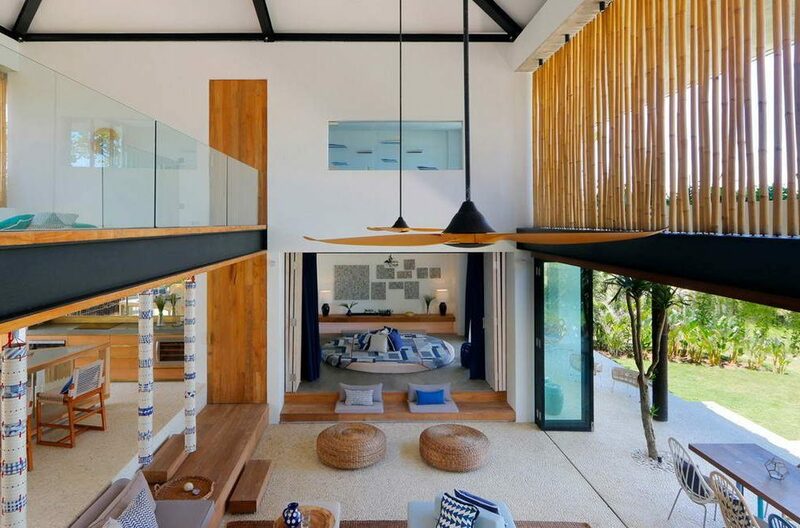 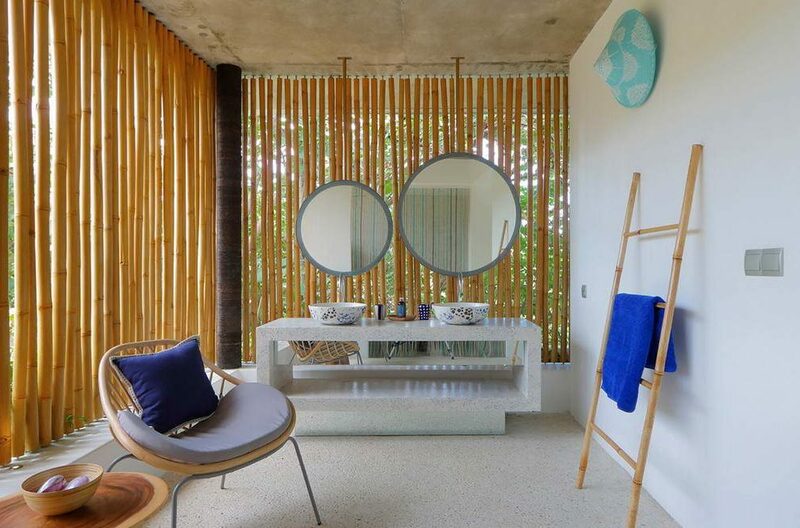 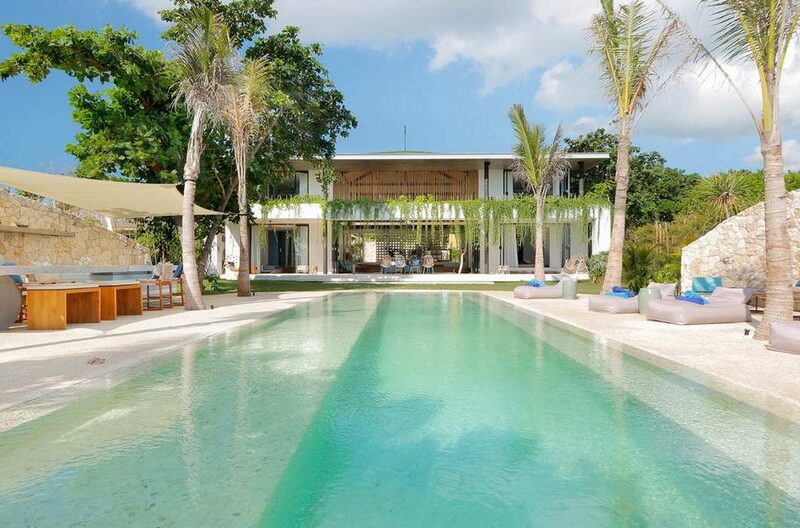 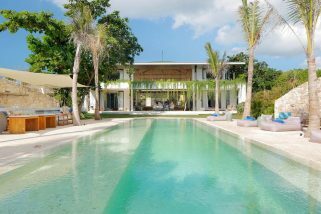 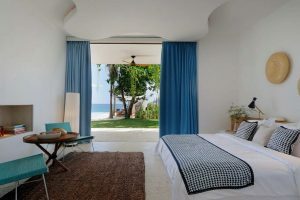 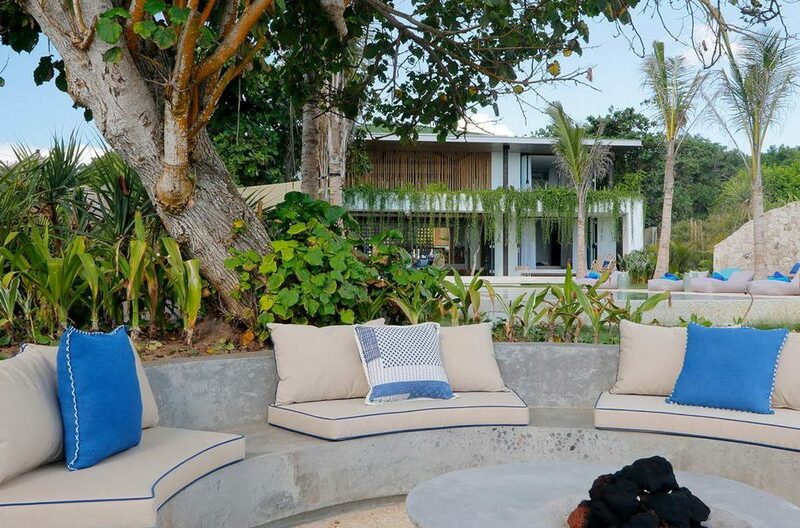 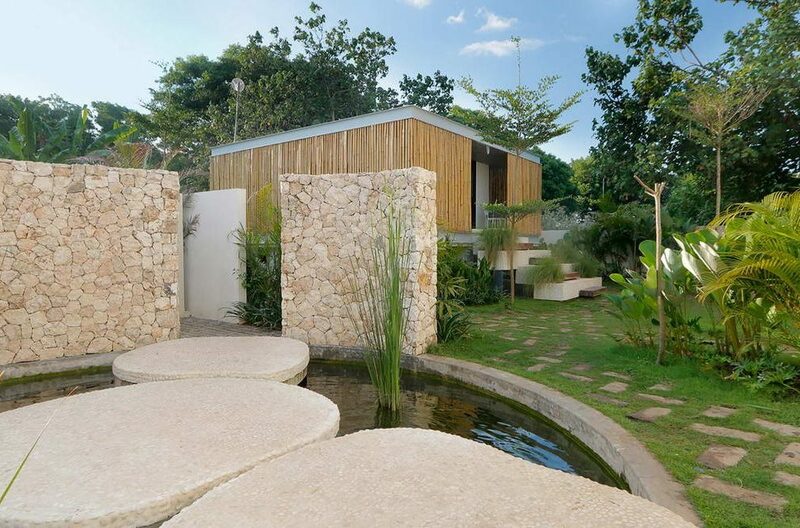 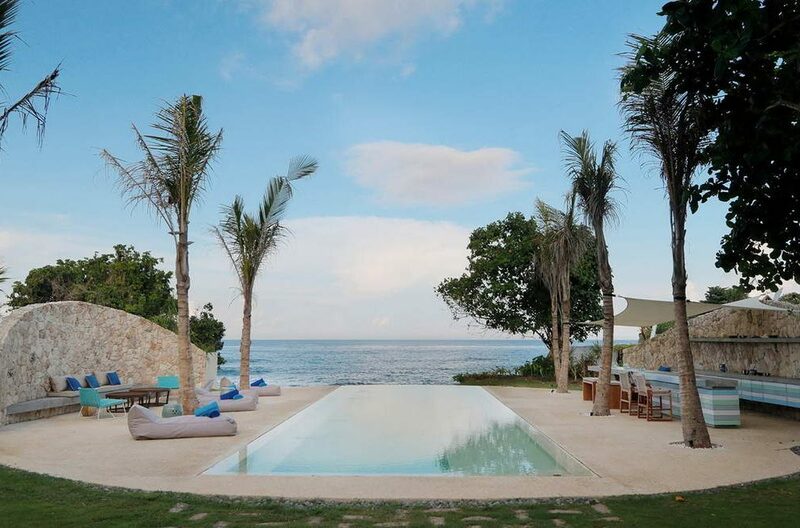 Why not stay at the beautiful island of Nusa Lembongan at 5 bedroom Villa Seascape, a stunning tropical hideaway accommodating up to 10 guests, just a short boat ride from the shores of Bali at Sanur. 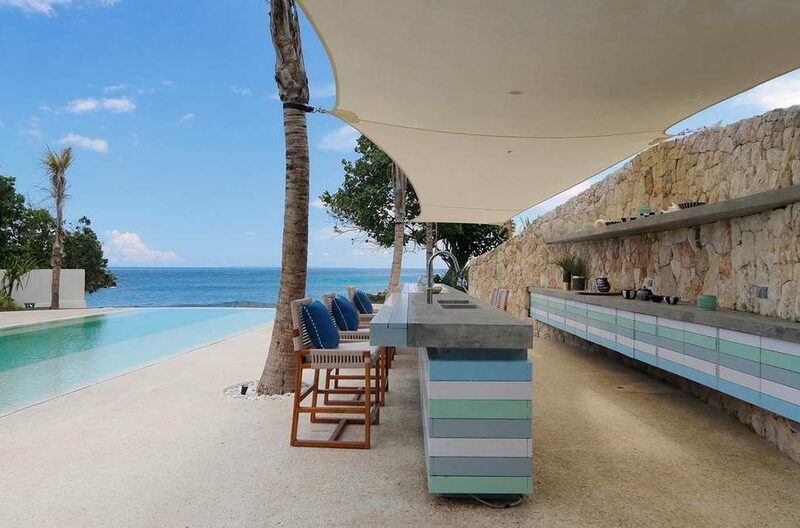 Chill out at the outdoor lounge and enjoy a drink from the infinity pools outdoor bar as the sun sets over the Indian Ocean. 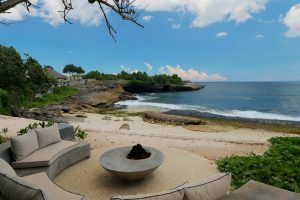 The kids will love exploring the hidden beaches near to the villa and neighboring Ceningan Island, snorkel with the clown fish or scuba dive among the manta rays at Manta Point; no doubt a memorable time to be enjoyed by all. 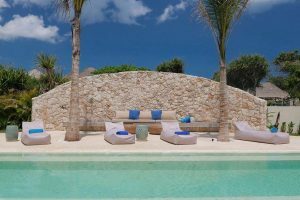 The villa boasts a 15 metre infinity pool set within a circular pool deck with a large built-in sofa to one side and pool bar on the other fashioned from local sandstone. 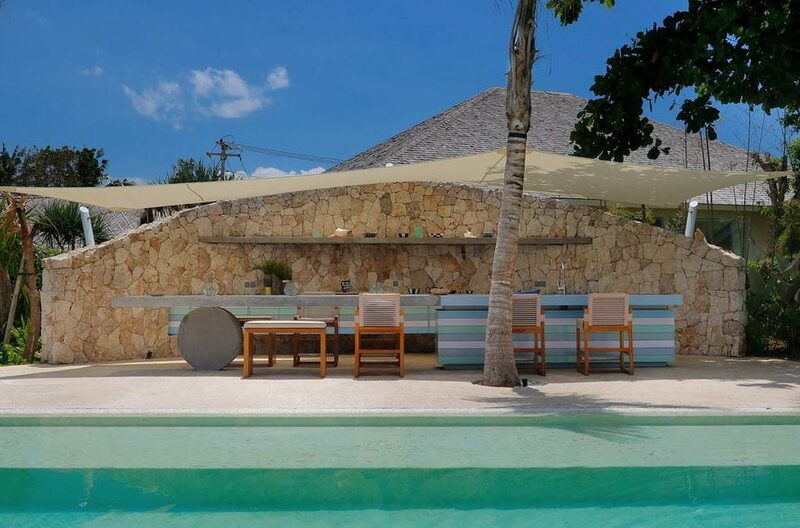 Swaying coconut palms, manicured lawns and the sandy beach are just meters from the pool, you couldn’t ask for a more idyllic outdoor holiday setting. Chill out in a poolside beanbag as the chef prepares fresh seafood on the outdoor BBQ hot plate.What a spot for a pool party or just quality time spent with your close friends and family. 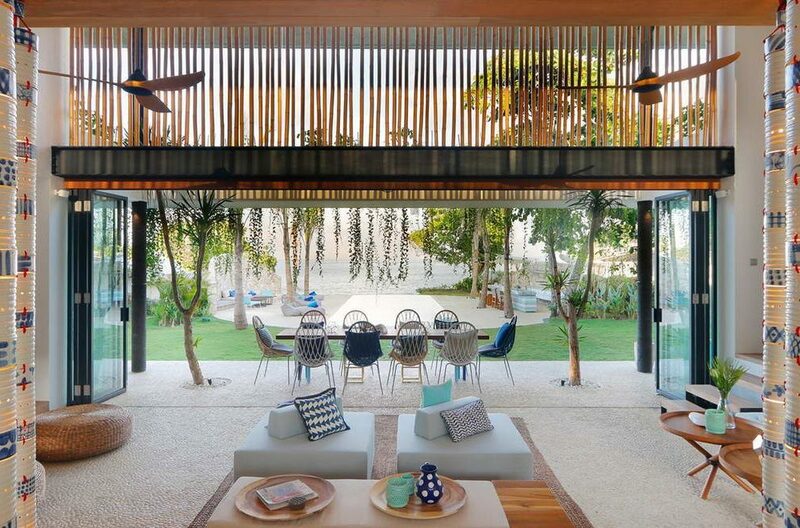 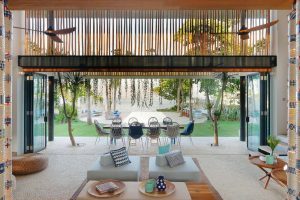 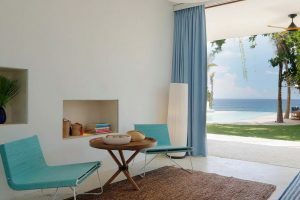 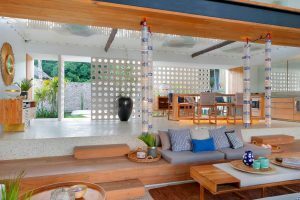 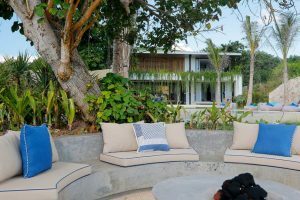 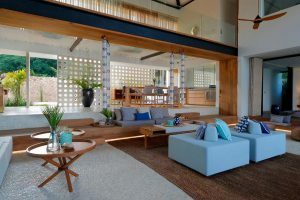 There are several living areas spread throughout the villa to ensure guests can enjoy a little private time enjoying a good book as well as a great social hub for fun and laughter. 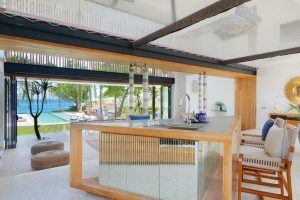 Crank up the Bose stereo system to set the vibe, maybe something light and romantic as you enjoy dining together at the formal dining table to seat 10 guests or sink into one of the plush sofas as you lay plans for the next day’s island adventure. The kitchen is fully equipped and it even has a wine cooler to keep the chardonnay at perfect drinking temperature. 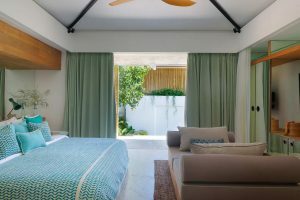 A separate media room provides air-conditioned comforts where you can sprawl out on the huge circular seating arrangement; this can also be converted into a fifth bedroom with its own private en-suite. 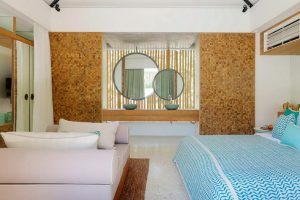 The bedrooms provide exceptional comforts for up to 10 guests, with the option of an additional sleeping arrangement in the media room. 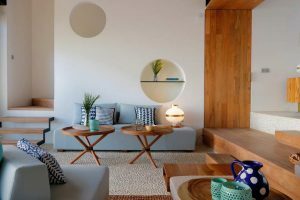 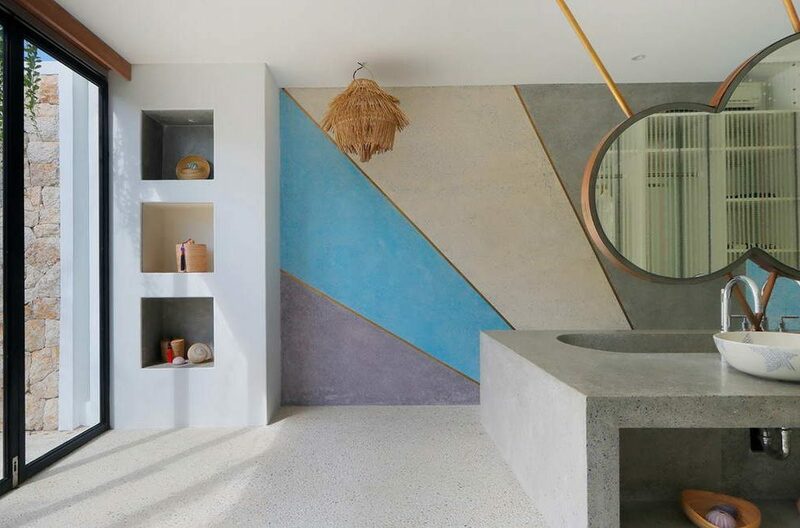 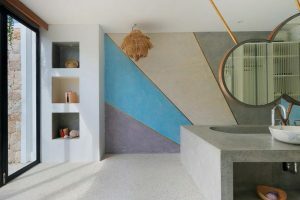 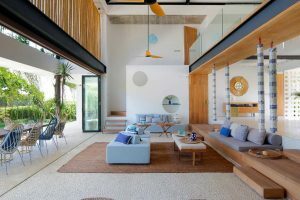 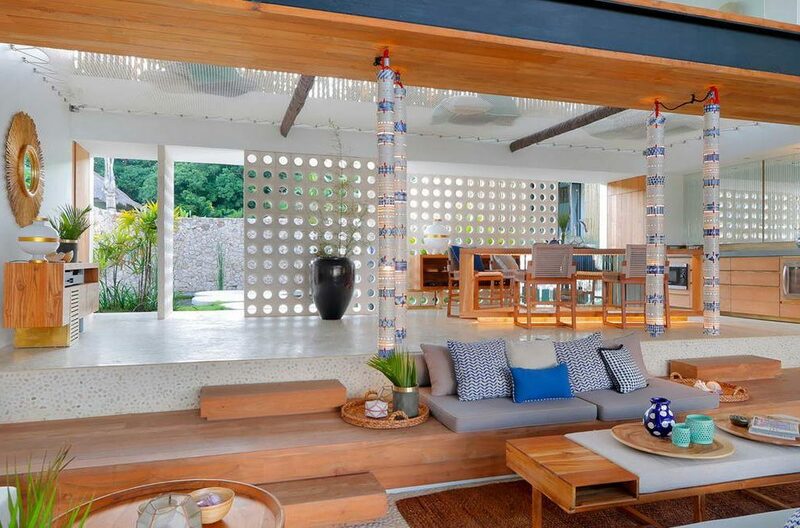 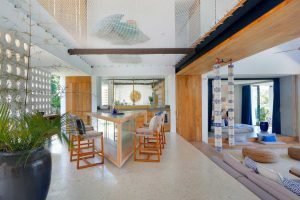 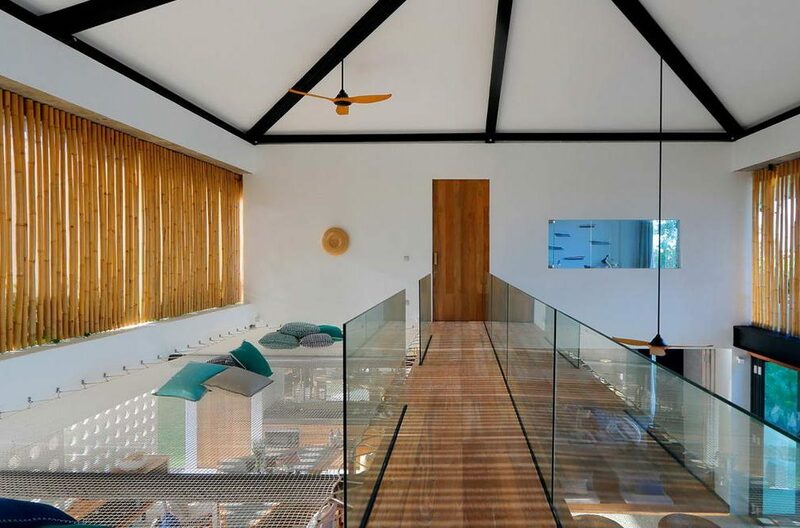 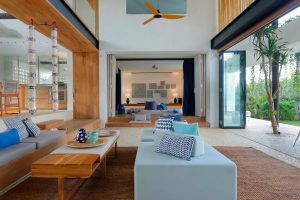 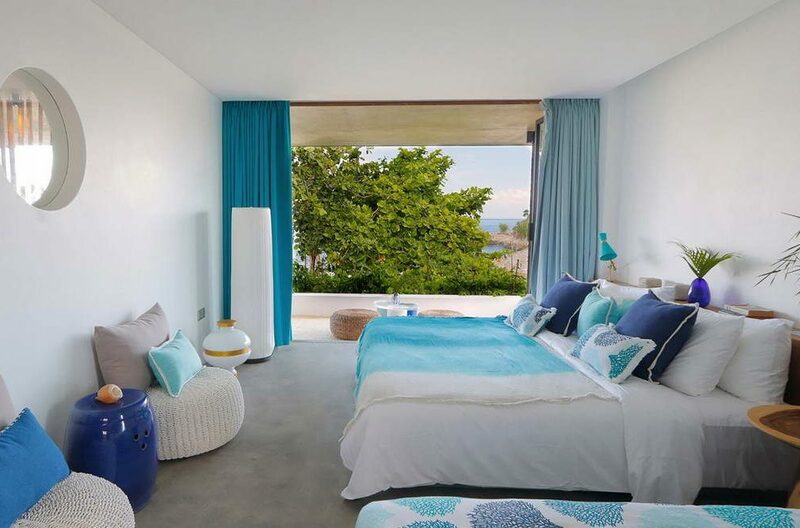 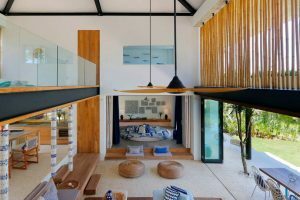 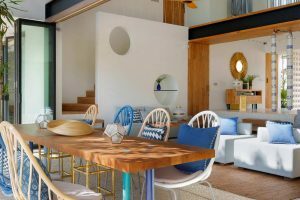 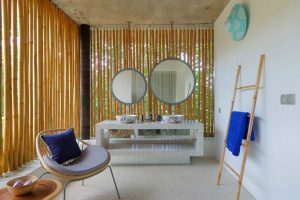 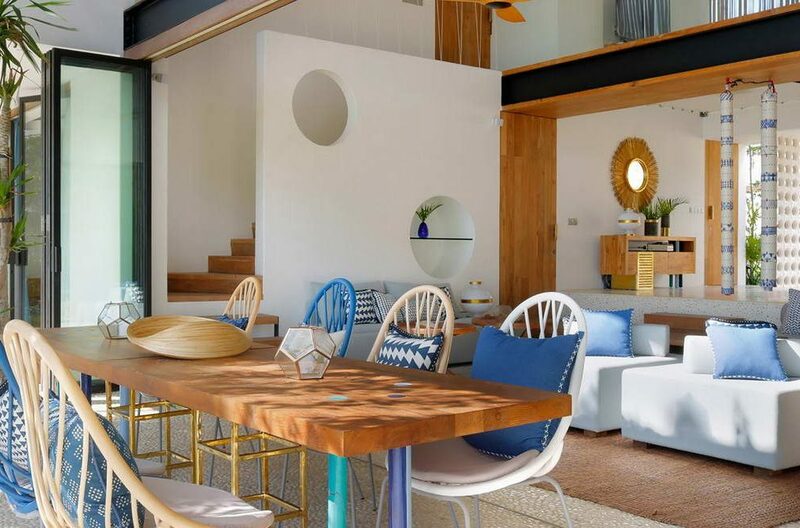 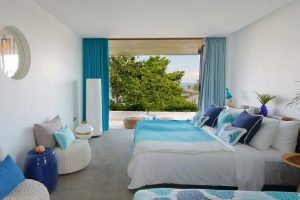 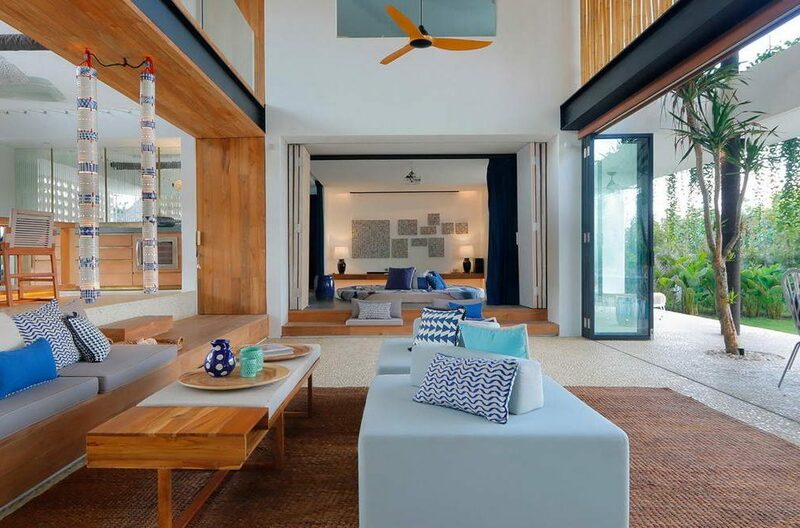 Cooling terrazzo flooring, full air-conditioning, and these rooms are totally chic with a nautical theme and hues of pastel blues and whites to carry on the tropical island theme. 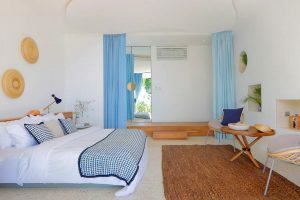 Three bedrooms boast king sized beds, another is furnished with three single beds, ideal for the kids. 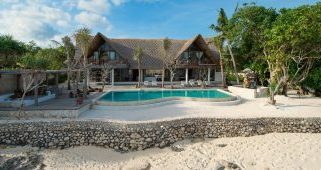 The villa staff consists of an English speaking villa manager, house maids, private chef and security personnel. The staff will assist in daytime activity directions, assist with all your transportation needs and prepare sumptuous tropical breakfasts each morning. 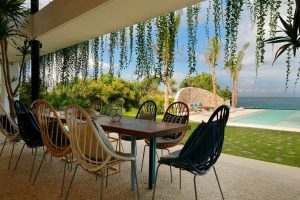 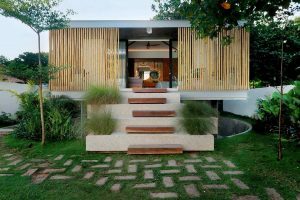 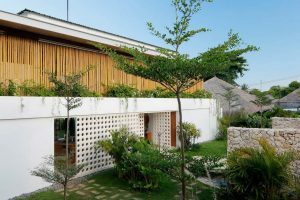 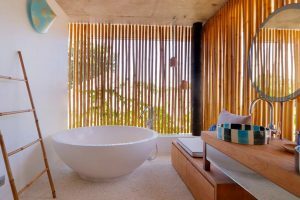 The villa is located on the island of Nusa Lembongan, easily accessible by fast boat or ferry from the port of Sanur on Bali’s mainland. 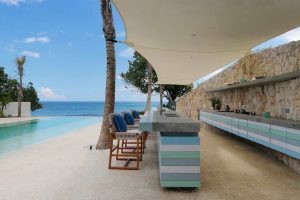 Spend some time swimming, snorkeling or scuba diving at nearby Dream Beach or take a jump from the cliffs into the turquoise waters at Devils Tear. Mushroom Bay has several small resorts where you can enjoy quality dining options and maybe head out for a surf on a stand up paddle board on the outlying reef. 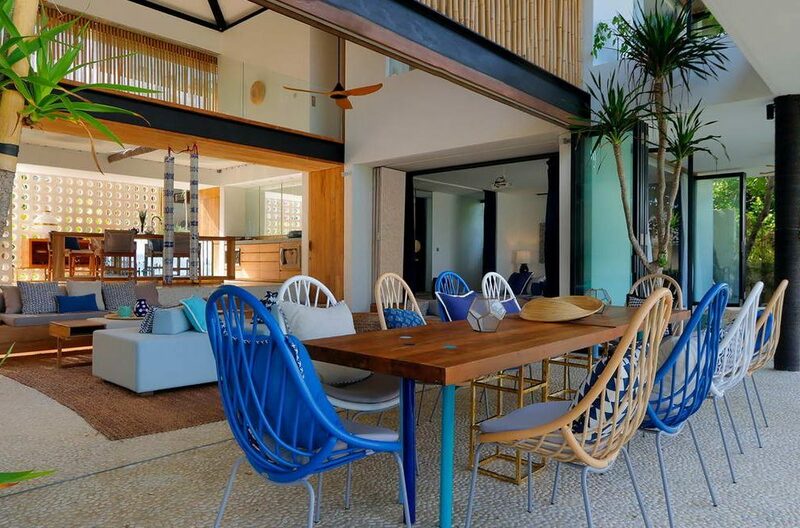 The Deck Café & Bar, Tigerlillys, the Bali Eco Deli and Lemongrass Bar & Grill are some great dining venues. 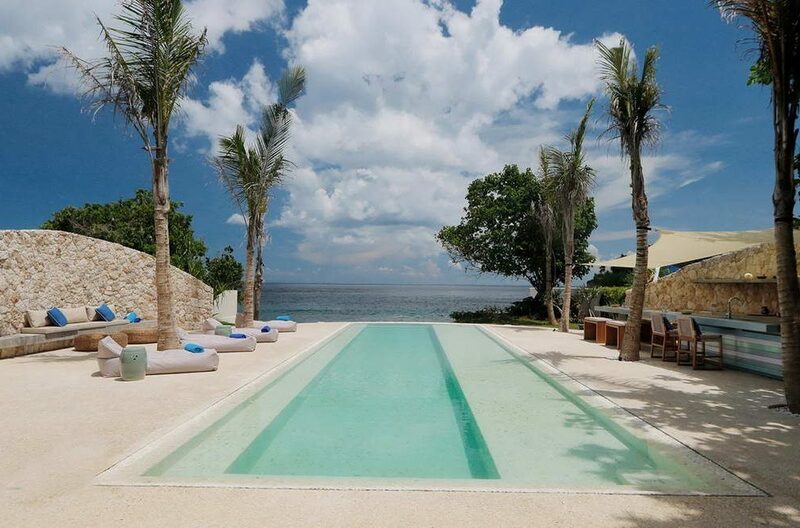 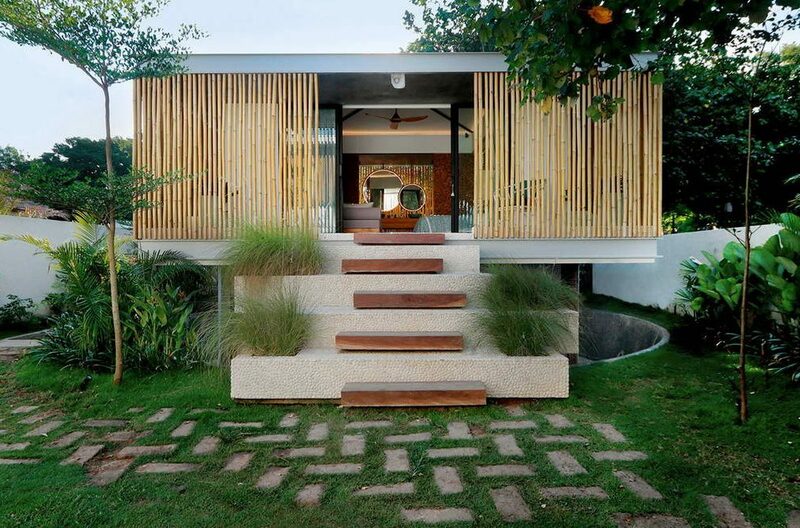 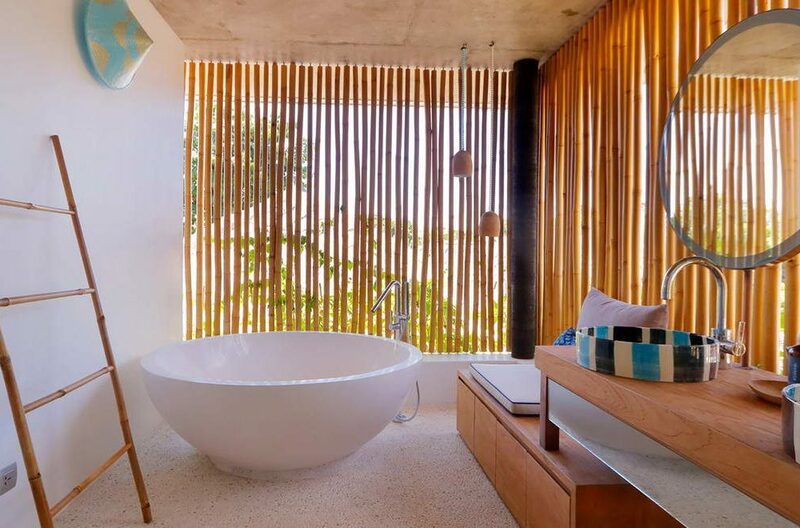 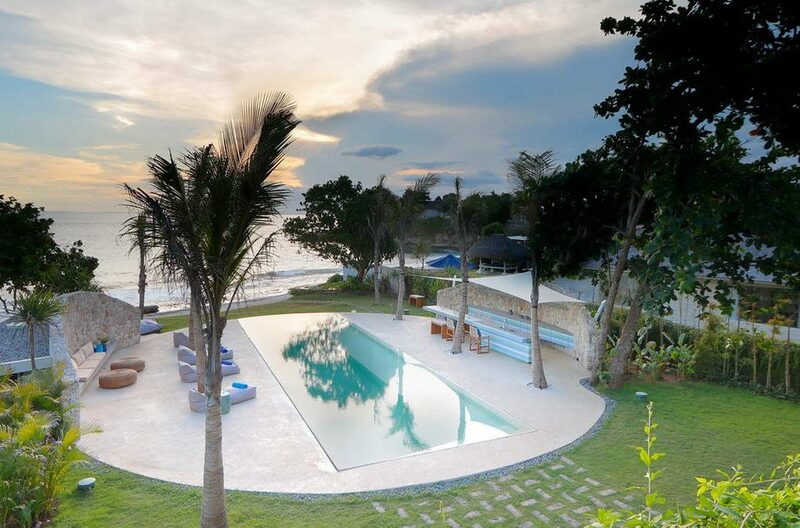 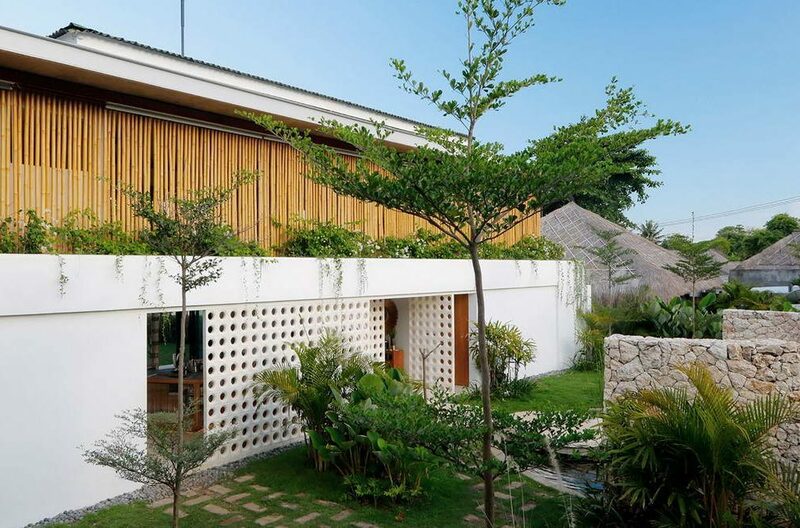 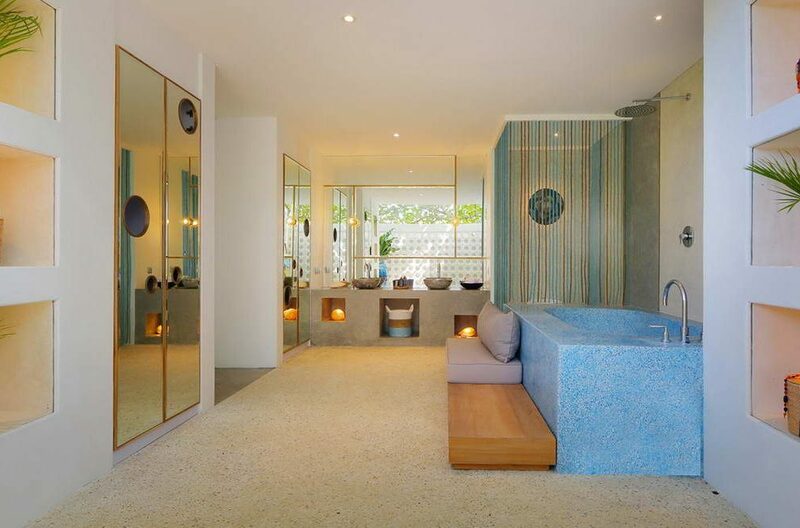 Nusa Lembongan is a small island situated off the eastern coast of Bali and plays host to the luxurious Villa Voyage. 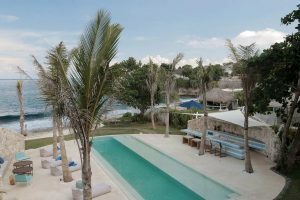 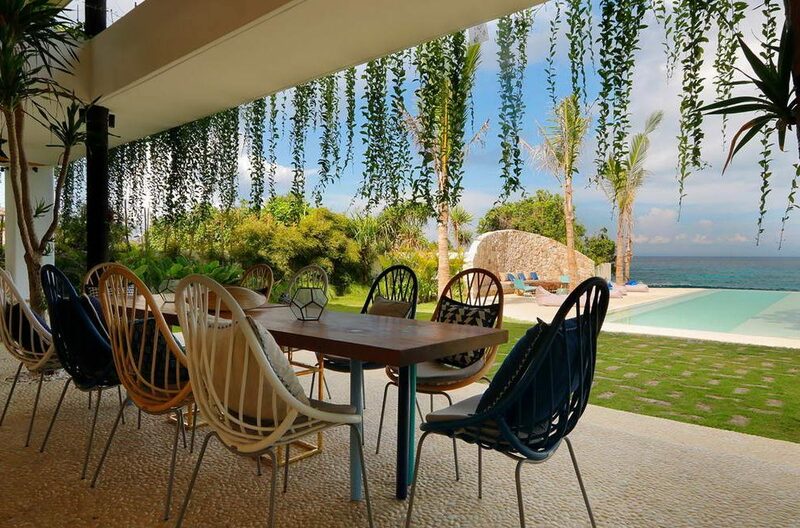 Why not stay at the beautiful island of Nusa Lembongan at 5 bedroom Villa Seascape, a stunning tropical hideaway accommodating up to 10 guests, just a short boat ride from the shores of Bali at Sanur.